Section 18(6) of the CGST act simply states that in case of sale of capital goods, any credit taken in respect of capital goods has to be reversed as calculated as per Rule 44 and added to the output tax liability for the month. The resulting amount of reversal will be the tax liability on the sale of capital goods or the tax on the transaction value of capital goods, whichever is higher. 2. They are so transferred that they no longer form part of business. 3. They are transferred under the instructions of the person carrying on the business. Note:- The assets should be sold by the person carrying on the business. Hence in case of calamity like fire, accident, theft there will be no liability to pay tax. Schedule I states that permanent disposal of assets even if made without consideration has to be treated as supply where ITC has been availed on such assets. This means that even writing off of capital goods will be treated as a taxable event. 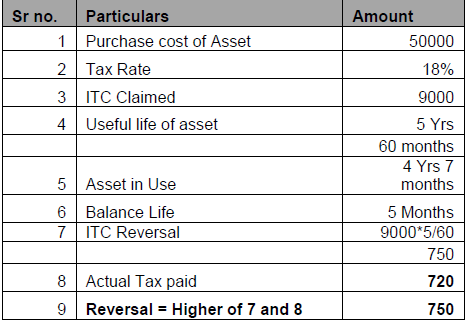 The above provisions are mentioned in the CGST act . For valuation purposes we have to look at the rules for sale of capital goods. Rule 44 contains the procedure for sale of capital goods. This is where the provision gets very complicated and requires special attention.